1.1.1 Is Zimbra free? What version do I need? 1.1.2 Can you explain how the pricing works? 1.1.3 How do you define a "mailbox license"? Is that one person? 1.1.4 Can I get Zimbra if I want fewer than 25 mailboxes? 1.1.5 Will Zimbra host ZCS for me? 1.1.6 I am running the Network Edition trial, how do I buy Zimbra? 1.1.7 I am running ZCS Open Source Edition, can I upgrade to Network Edition? 1.1.8 Is it possible to mix ZCS Open Source Edition accounts with Network Edition accounts in one installation? 1.1.9 Can I have some accounts running ZCS Network Edition Professional and then most accounts running Standard in my installation? 1.1.10 How much storage does each Zimbra account come with? 1.1.11 How do I get Zimbra Support? What options are available? 1.1.12 Do I have a phone support? 1.1.13 What happens when my Network Edition 60 day Trial license expires? 1.1.14 What is the Support and Maintenance renewal policy for customers on Zimbra Perpetual license ? 1.2.1 What are the prerequisites for installing ZCS and how do I avoid install hassles? 1.2.2 Avoiding conflicts: what are the default port configurations when Zimbra is installed? 1.2.3 How do I make sure that DNS is configured correctly? 1.2.4 What are the top issues affecting performance? 1.2.5 How does the license key work? 1.2.6 I get the error "can't change install type from trial to trial" when I try to apply a license. 1.2.7 I can't get to the Admin UI when I type in the URL into my browser. 1.2.8 How do I change the Zimbra server's hostname? 1.2.9 We use Active Directory, what level of "access" into AD does Zimbra need to authenticate users? 1.2.10 How do I access the Exchange migration tools? 1.2.11 Are there any known installation issues or help for troubleshooting? 1.3.1 What features are available in the Network Edition Trial? 1.3.2 What phones are supported by Zimbra Mobile? 1.3.3 Which browsers does the web client work with? 1.3.4 What versions of the Ubuntu Linux OS does Zimbra support? 1.3.5 What languages is Zimbra translated into? 1.3.6 Does Zimbra set a storage limit or quota on accounts? 1.3.7 Can Zimbra scale to support large installations? 1.3.8 Does Zimbra support clustering? 1.3.9 Are there any instructions on making and installing Zimlets? 1.3.10 Can you add 3rd party services to Zimbra like Barracuda AS/AV? 1.3.11 Is there a Zimbra Hosted solution? Is Zimbra free? What version do I need? 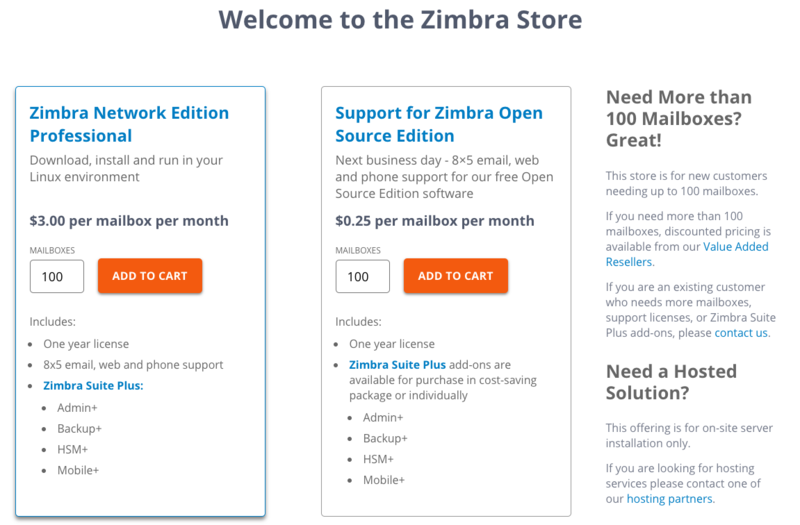 Zimbra has both a free Open Source Edition as well as a premium Network Edition. Can you explain how the pricing works? A business wanting 150 mailboxes of the Professional Edition: $28 x 150 = $4,200 per year. This license commitment is eligible for Zimbra Basic Support. A government agency looking for the same package: $14 x 150 = $2,100 per year. Also eligible for Zimbra Basic Support. How do you define a "mailbox license"? Is that one person? Now it is possible to have an account set up for a virtual "role" within your organization that may not be staffed by an individual. So, to decide how many licenses you want to purchase the next question becomes when do you need a new account versus just using an alias or distribution list (which are not considered new accounts). Account: "Jane@work.com", she has a mailbox, calendar, documents, quota, etc. An account is considered a provisioned account that is counted against your license, regardless of the account status. The only accounts that are not counted against your license are system accounts (for example spam and archiving), and external virtual accounts (for example, a share granted to a user on another email system). Alias: She can also be "jane.smith@work.com" or even "info@work.com". Jane could receive email sent to info@work.com and would reply back as "jane@work.com"
To have a permanent role in your organization for "info@work.com" that doesn't disappear if Jane moves you will want a new account. This way others can log in to check the email, you will have an archive, you can reply back to messages as "info", plus Jane won't have all the "info@work.com" counting against quota. Important: Zimbra Collaboration count disabled or inactive mailboxes against your license, because you are retaining a copy of the data and have access to the account. If you don't want the mailbox counted against your license, you can retain a copy of the account by exporting the data using your own method or you can delete the account. Can I get Zimbra if I want fewer than 25 mailboxes? You can purchase up to 100 mailboxes licenses directly in our new Zimbra Shop, where you will be able to select the number of Mailboxes, pay and receive the license straight away. Will Zimbra host ZCS for me? No, we only sell the software license. If you want someone to host Zimbra for you we have many Hosting Partners who can provide you with that service. You can purchase ZCS by contacting your sales representative or simply buy online. Things to know: the number of Standard / Professional Edition mailbox licenses you want, if you need Zimbra Mobile, Zimbra Archiving and Discovery or any Support options and they will provide you with a quote form and contract to sign. Not sure who your sales contact is?, just email sales@zimbra.com. I am running ZCS Open Source Edition, can I upgrade to Network Edition? Yes. The process is the same as a typical upgrade. Follow the installation process by running ./install.sh (You should get prompted if you want to upgrade from an existing version of Zimbra, in this case OSS. Choose 'Yes' and follow directions). Is it possible to mix ZCS Open Source Edition accounts with Network Edition accounts in one installation? Unfortunately you can not mix them, but there are multiple versions of Network Edition available to meet varying needs. Can I have some accounts running ZCS Network Edition Professional and then most accounts running Standard in my installation? Yes. From a features standpoint, this is managed by "Class of Service" in the Administration Console where you can set up different features per account. A business running ZCS on-premise that wants to have 50 accounts with Standard and 50 with Professional features would purchase 50 of each license respectively. Service providers can also define their own COS, but should contact Sales for details on the resale pricing model. How much storage does each Zimbra account come with? If you are installing ZCS on premise then storage is only limited by how much physical storage space you wish to allocate to each account (eg it can be unlimited, 10GB, 2GB, etc) depending on hardware constraints. The Administration Console allows your IT team to easily set up "Class of Service" for the accounts. If you wish to purchase a Zimbra account from a hosted service provider, they will determine how much storage will be allocated to you; typically based on industry norms. How do I get Zimbra Support? What options are available? Zimbra Support is provided to users who purchase ZCS Network Edition. All customers who purchase are eligible for Basic service which includes Email, Support Portal access, Knowledge Base, and upgrades. Customers with a qualifying license commitment are eligible for Premium service which includes phone and 24x7 crisis support. Basic service customers are able to purchase "Per Incident" phone and crisis support if they wish. Network trial users are also eligible for Basic support for the duration of their 60-day trial. Do I have a phone support? Paying customers must have Premium support service on top of their Basic support service. Network trial users are eligible for Basic Support only, which does not include phone support. What happens when my Network Edition 60 day Trial license expires? Of course, if you're not ready to purchase Network Edition but like Zimbra, you can always revert the Trial to the Open Source Edition. You will lose all the Network Edition benefits, but your data will still be intact plus you will have the basic features. What is the Support and Maintenance renewal policy for customers on Zimbra Perpetual license ? Customers under a perpetual license must pay 20% support during the first year, and thereafter can elect annually whether to renew Support and Maintenance. Such customers must be under a current Support agreement to be eligible to receive any minor updates (such as 6.0.x) including security patches/updates, major updates (such as 6.x) or new versions (such as 7.0). Customers who choose to not renew their Support at the time of the annual renewal may subsequently resume Support, and have access to product updates and upgrades, by paying the "true up amount" back to the time of non-renewal. An additional reinstatement fee may also be applied. For example, if the customer fails to renew for 6 months, in order to resume Support, the customer must pay 18 months (6 months of unpaid support + 1 year of support from date of renewal) to get back on the Support and Maintenance plan. Here's some gotchas we hear about from the Zimbra Community when installing and configuring ZCS. Hope this makes for smooth sailing! What are the prerequisites for installing ZCS and how do I avoid install hassles? See the "ZCS System Requirements" document at https://files.zimbra.com/website/docs/8.6/ZCS_System_Requirements_8.6.0.pdf for the most up to date requirements. Do you have all the install pre-req's ironed out and port conflicts resolved? Installation will check and fail on any of these conditions. You can find a complete Wiki article with all the OS dependencies in the next Wiki article. Avoiding conflicts: what are the default port configurations when Zimbra is installed? See Ports for a more complete list. How do I make sure that DNS is configured correctly? What are the top issues affecting performance? Make sure that your client machines satisfy the system requirements for systems specs, operating system, and browser. Make sure the server machines meet the system requirements for hardware and operating system; size your hardware with growth in mind! RAM requirements: For single server installations, a minimum of 8GB of RAM is required. For multi-server installations, contact Zimbra sales for recommendations. RAM requirements:For single server installations, a minimum of 8GB of RAM is required. Temp files space: The zimbra-store requires 5GB for /opt/zimbra, plus additional space for mail storage. The other nodes require 100MB. RAID-5 is not recommended for installations with more than 100 accounts. The license key is provided to you in the Network trial registration email from the Sales Team. When you do the installation you will automatically be provided a single user license (admin) to enable the install. From the Admin UI (Global Settings / License / Update License) you can then apply the key to the trial system and provision up to 50 accounts for the life of the trial. After the trial expires you will no longer be able to add new accounts but the ones you already have provisioned may still work for some time. I get the error "can't change install type from trial to trial" when I try to apply a license. You cannot update trial license with a new trial license key. Please contact your Zimbra sales representative to obtain an extended trial license. I can't get to the Admin UI when I type in the URL into my browser. Make sure the URL connects to the Admin UI using SSL: "https" and to port ":7071" by default. How do I change the Zimbra server's hostname? We use Active Directory, what level of "access" into AD does Zimbra need to authenticate users? In order for Zimbra to use external AD/LDAP for authentication and/or GAL, you need to create a user that can see all user objects in the AD schema. Configuration of external auth/GAL is by means of an easy wizard in the Admin UI. How do I access the Exchange migration tools? Click Downloads at the top right of the Administration Console to find the Migration tools and documentation. Are there any known installation issues or help for troubleshooting? Take a look at Installation Issues for more tips. What features are available in the Network Edition Trial? The Trial is fully featured: you have full access to everything including Outlook Connector, Zimbra Mobile, Clustering, and HSM for 60 days. What phones are supported by Zimbra Mobile? Blackberry is supported through a third party partner. Which browsers does the web client work with? See the "ZCS System Requirements" document at https://wiki.zimbra.com/wiki/Zimbra_Releases/8.7.0/Single_Server_Installation#System_Requirements or the latest release notes for the most up-to-date information. What versions of the Ubuntu Linux OS does Zimbra support? We support Ubuntu 12.04 LTS (deprecated since ZCS 8.8 and above), 14.04 LTS and 16.04LTS(Long Term Support), Zimbra Collaboration 8.0.x also supports Ubuntu 10.04 LTS but ZCS and that Ubuntu version are deprecated. This is the 'enterprise' version of Ubuntu and is officially supported by Canonical, the commercial arm of Ubuntu (this version will be supported by them for the next 3 - 5 years). When the next release candidate of "LTS" is available we will support it; the next candidate is likely 18 - 24 months out. What languages is Zimbra translated into? French, German, Italian, Japanese, Finnish, Russian, among others. Does Zimbra set a storage limit or quota on accounts? Administrators can set any storage quota limit they feel is appropriate for an account (or multiple accounts via Class of Service) in a deployment, eg 54MB, 2.2GB, 4GB... Technically there is no physical storage limit imposed by the ZCS platform itself. But practically speaking, storage limits should be set based on the physical hard drive space available, number of users, limitations present in any sync 'end points', and overall growth projections. Can Zimbra scale to support large installations? Zimbra supports installations from 25 mailboxes well past 1 million. Zimbra will support an Always On/HA Infrastructure in a future versions of Zimbra Collaboration. Are there any instructions on making and installing Zimlets? Can you add 3rd party services to Zimbra like Barracuda AS/AV? Yes - in addition to our native AS/AV, we can integrate with external AS/AV and many customers have done this. Is there a Zimbra Hosted solution? Yes, you can have Zimbra hosted for you by working with one of our hundreds of Hosting Partners.